Getting away from it all with an off-grid camping trip doesn’t mean you have to sacrifice your home comforts. There is nothing better than waking up to the smell of coffee wafting across your campsite, enticing you to get out of your sleeping bag. Coffee and camping go hand in hand and just because you are off the grid, it doesn’t mean you have to resort to nasty instant coffee mixes. 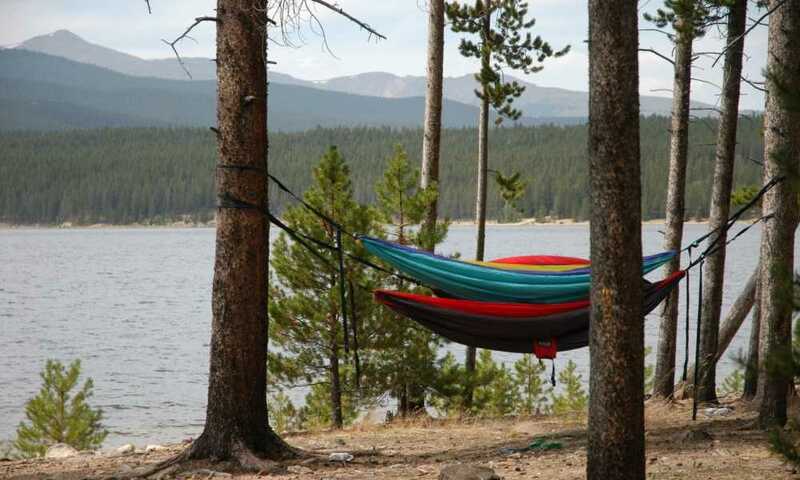 With some basic equipment such as a camping stove and a camping-specific percolator, you can quickly, easily, and enjoyably brew up a cup of your favorite fresh ground coffee to saver under the stars or wake you in the morning. Let’s take a look at three of the best camping percolators. Farberware has been making cookware since 1900, so you can rest assured they know a few things about coffee percolators. Farberware claims that brewing coffee in a percolator using the stovetop method extracts more flavor for a richer, smoother drink. Whether that is true or not, this percolator will undoubtedly be a great addition to any kitchen or camping set up. It retains the look and feel of a traditional enamel percolator but has been refined with the finish of a modern classic. Made from 18/10 stainless steel, the body has been polished to a mirror shine finish. It’s large enough to make up to 8 cups of coffee at a time, so is perfect for family camping trips or entertaining at home. The Farberware Classic Stainless-Steel Yosemite 8-Cup Coffee Percolator has a permanent stainless steel filter basket and pump tube, so there is no need to use messy paper filters. An additional modern twist to this classic design is the ergonomic and sturdy handle for smooth operation on the stovetop or camping gas stove. The lid is tight fitting, creating the perfect seal and helps keep the coffee warm on completion. The addition of a clear Perspex knob allows you to see clearly when the coffee is brewed. The Farberware Classic Stainless Steel Yosemite 8-Cup Coffee Percolator is dishwasher safe when used at home and comes with a lifetime warranty. 18/10 is the best quality stainless steel for cookware for durability and heat distribution. Simple construction and allows for use without filter paper. Comfortable and sturdy for easy operation. Not recommended for placing into open fires which is part of the fun of camping percolators. The Coletti “Bozeman” Percolator Coffee Pot is a great looking, modern percolator named after the rugged city of Bozeman, Montana! Made from polished 18/10 stainless steel with a wood handle and glass percolator viewing knob, it would suit a modern kitchen well. Its simple design makes this percolator your best friend on the toughest of camping trips, and the wooden handle makes this safe to use directly on campfires and log burners. 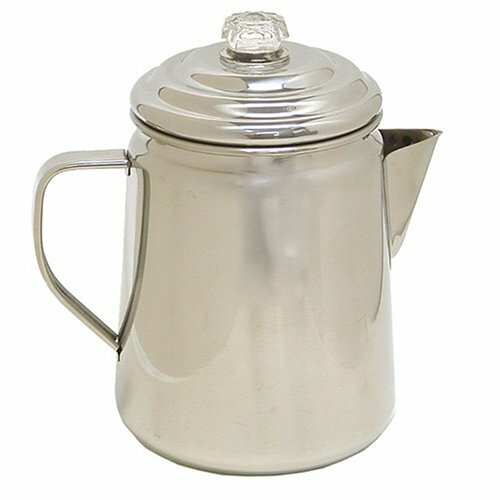 The Coletti “Bozeman” Percolator Coffee Pot has a removable stainless steel coffee basket which makes it easy to clean. While not essential for the operation, they do recommend using filter papers for fine ground coffees to get the perfect brew. Interestingly, Coletti donates 100% of profits from the sales of these percolators to helping charitable foundations for women and children in need. So not only can you brew the perfect camping coffee or stovetop brew, you can do so knowing that you are funding some excellent causes across the globe. Looks excellent with functional hinges and simple styling. The traditional wooden handle is suitable for campfire cooking, although will char if allowed to impact direct flames. Coleman is another American household institution having made lanterns and practical household items for over 100 years. The Coleman 12-Cup Stainless Steel Coffee Percolator is a no-frills, lightweight, stainless steel coffee percolator designed with function in mind. 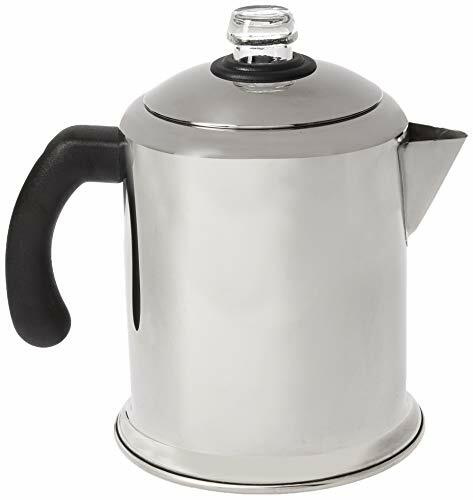 The percolator comes with a removable coffee basket and pump tube and uses a glass lid knob and stainless steel handle. This is a 12-cup model and as such is perfect for large camping groups but can also still function as a 1 to 2-cup machine. This percolator could be used at home, although the styling is more suited to a camping kit than a modern kitchen. The stainless steel handle makes this model suitable for campfire cooking as well as for use on gas stoves. Suitable for up to 12 cups, this coffee percolator will serve up coffee for large families and groups. Heat resistant even in the center of the flames. Better looking machines for home use. There are three great coffee percolators here to suit all tastes, uses, and budgets. If you want a percolator that you can throw in your camping bag, use in a campfire, and serve up a brew for years to come, then you won’t go far wrong with the Coleman 12-Cup Stainless Steel Coffee Percolator. It’s a real workhorse percolator, suitable for all camping situations, but probably not the prettiest machine if you want to use it at home as well. The Farberware Classic Stainless-Steel Yosemite 8-Cup Coffee Percolator is a beautiful looking machine and will undoubtedly provide excellent stovetop coffee at home and could be used on a camping gas stove but not a campfire. If I had to choose one pot, I would probably go for the Coletti Bozeman Percolator Coffee Pot as this will work well both at home and at the campsite. I also like the idea of drinking coffee while helping charities across the globe. Whatever you choose, savor and enjoy the flavor of coffee the way it was meant to taste!